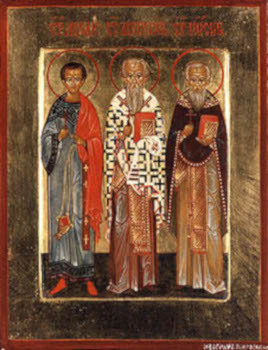 Science of the Saints, 16-XI-2018 (3 Nov.), Martyrs Akepsimos the Bishop, Joseph the Presbyter and Haiphal the Deacon. Bishop Akepsimos headed the Christian Church in the Persian city of Naesson. His flock devotedly loved their hierarch for his ascetic life and tireless pastoral work. The emperor Sapor gave orders to seek out and kill Christian clergy. Saint Akepsimos also was arrested, being then already an eighty year old man. They took him to the city of Arbela, where he came before the judge Ardarkh – a pagan priest of the sun god. The holy elder refused to offer sacrifice to the Persian gods. For this he was fiercely beaten and thrown into prison, where on the following day they threw in with him, after fierce beatings, the seventy year old Presbyter Joseph and Deacon Haiphal. For three years the saints were held in confinement, and worn down by hunger and thirst. Emperor Sapor came to the temple of the god of fire, located not far from Arbela, and wanted to take a look at the three holy martyrs. Exhausted and covered with festering wounds, the saints were brought before the emperor and at his demand they again firmly refused to worship the pagan gods, instead confessing their faith in Christ. The holy bishop was beheaded, but the presbyter and deacon were sent off within the city and there to be stoned. The execution of the presbyter Joseph was prolonged for several hours. A guard was placed near the place of execution, so that Christians would not take the body of the holy martyr. On the fourth night a strong windstorm raged near the city, lightning killed the guard, the wind threw about stones, and the body of Saint Joseph disappeared. The deacon Haifal was taken to the village of Patrias and there he was stoned. Christians secretly buried his body. On the grave of the saint there grew a tree, the fruit of which brought healings.